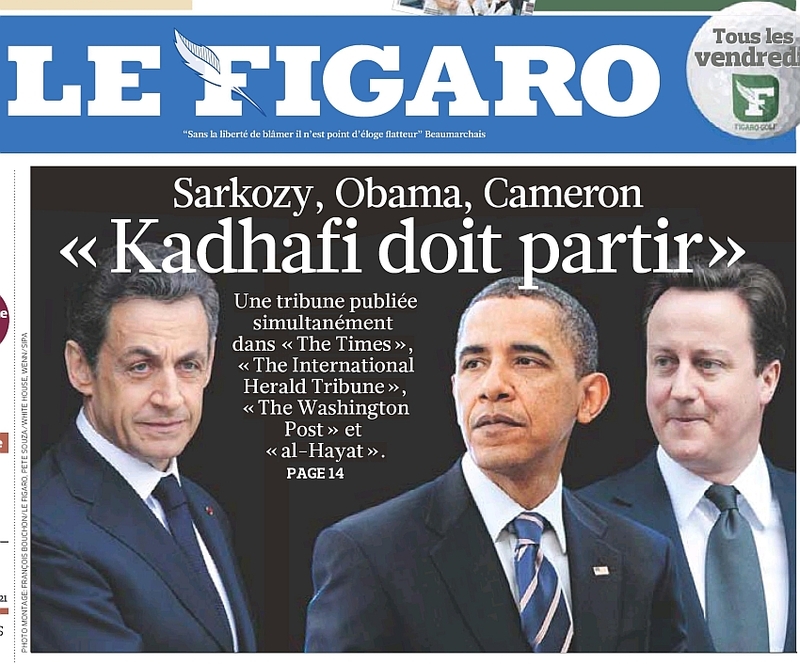 Le Figaro, 15 April 2011 Sarkozy, Obama, Cameron: “Gaddafi must go"
“We regard the National Transitional Council [in Libya] as legitimate political interlocutors for the UK. The National Security Council [National Transitional Council] has decided that we will now move quickly to expand the [British] team already in Benghazi led by [senior diplomat] Christopher Prentice to include an additional military liaison advisory team. Murnaghan: [...] I say a year into the coalition, a year on, it’s almost like we’ve rewound in some aspects to 2003 in that we have a British Prime Minister, a US President and indeed others, talking about regime change in an oil rich Muslim country without full international legal cover. Murnaghan: Well it’s said, and I’m sure you’ve looked at it, that there is some wriggle room in that UN Resolution 1973 when it comes to forces on the ground there, that it talks about no occupation force but clearly looking towards Colonel Gaddafi. If it took ground forces, can you guarantee there would be no British ground forces employed? Murnaghan: [...] Could it ultimately lead to some form of on the ground invasion force – it doesn’t stay there, it’s not an occupation force but to fulfil the Resolution 1973 to protect those civilians, do you have to go further here militarily? Murnaghan: So you are categorically ruling out putting any form of British troops, British forces, on the ground in the Libya? Cameron: What I’ve said is there is no occupying force, no invasion, that is absolutely clear, that hasn’t changed right from the start, I said that and the position hasn’t changed. Murnaghan: But it could be temporary? Cameron: Dermot, I think I’ve answered the question and I’ve said this many times, there’s no change in our position. We are complying with the UN Security Council Resolution, we’re not occupying, we’re not invading, that’s not what we’re about and that is obviously a restriction on us but I think it’s the right restriction. “Our duty and our mandate under UN Security Council Resolution 1973 is to protect civilians, and we are doing that. It is not to remove Gaddafi by force. 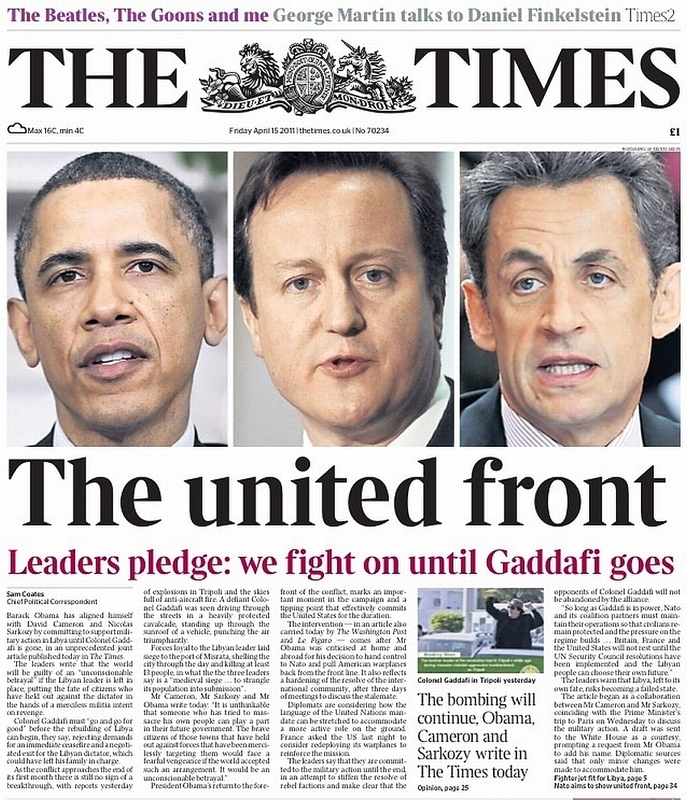 But it is impossible to imagine a future for Libya with Gaddafi in power. [..] It is unthinkable that someone who has tried to massacre his own people can play a part in their future government. [...] It would be an unconscionable betrayal. 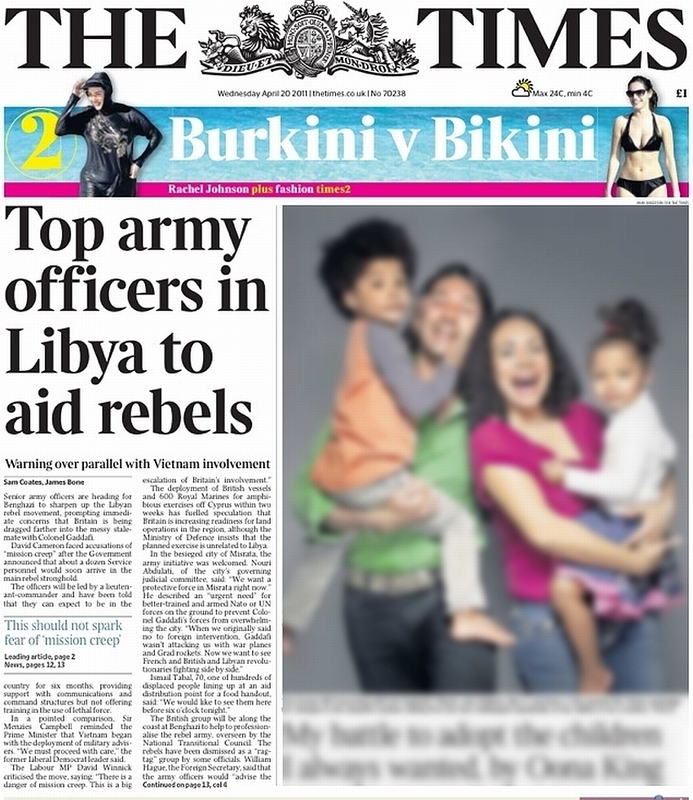 (*) title of The Times’ print edition. When war games go live: "Staging" a "humanitarian war" against "SOUTHLAND"
I really appreciate your cataloging of war propaganda in the MSM UK press. I am amazed at the omissive and distorted reporting of this so-called "Arab Spring" and in particular the insidious spin of events in Libya. 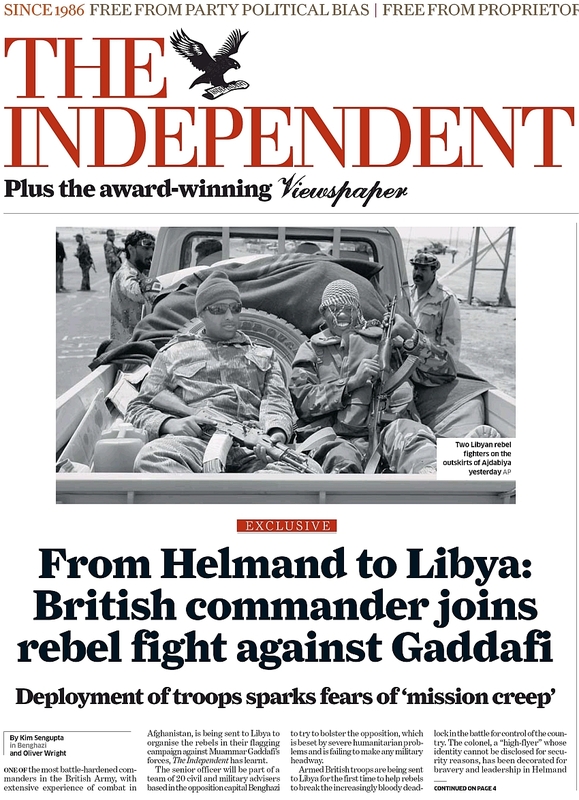 The BBC's reporting of the war in Libya, as with all their stories concerning the "war on terror", are factually suspect and inherently misleading. The BBC's (and other MSM outlets) constant omissions, such as Depleted Uranium weapons being used in Libya, are scandalous. nmollo on Thu, 04/21/2011 - 6:23am.